As we were paging through our newest edition of Cooking Light, the recipe for Grilled Rosemary Chicken with Farro Risotto grabbed our attention. It was just up our alley — grilled meat with a creamy risotto-style side. I was so excited! I knew this would be a perfect recipe to share with you. Well, my Honey immediately burst my excited bubble . . . he reminded me of the last time I was so certain of a recipe’s taste perfection. 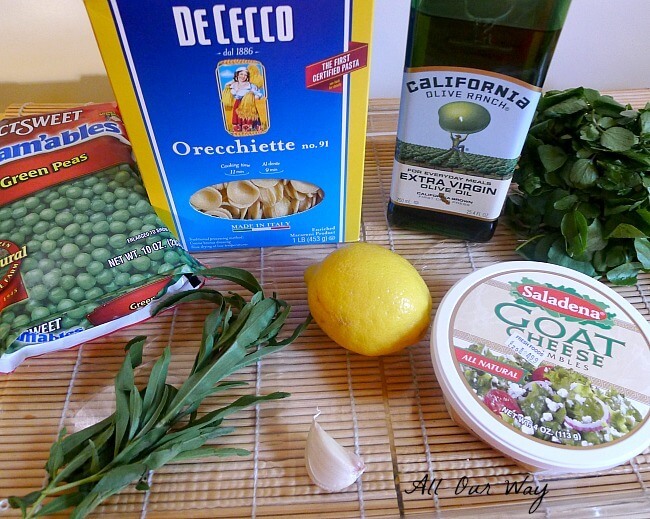 That time I also thought I’d found the the best springtime recipe to share with you. The dish featured orecchiette but what excited me was that it also included peppery watercress, something I’d never worked with before. But that wasn’t all, it also had a fresh pesto-type sauce made with spring peas seasoned with tarragon and lemon. Wow! That was something else I hadn’t done before — make a pesto out of peas. Oooh! I could almost taste the wonderful springtime flavors– I couldn’t wait to make the dish. I really enjoy making and trying new things, don’t you? 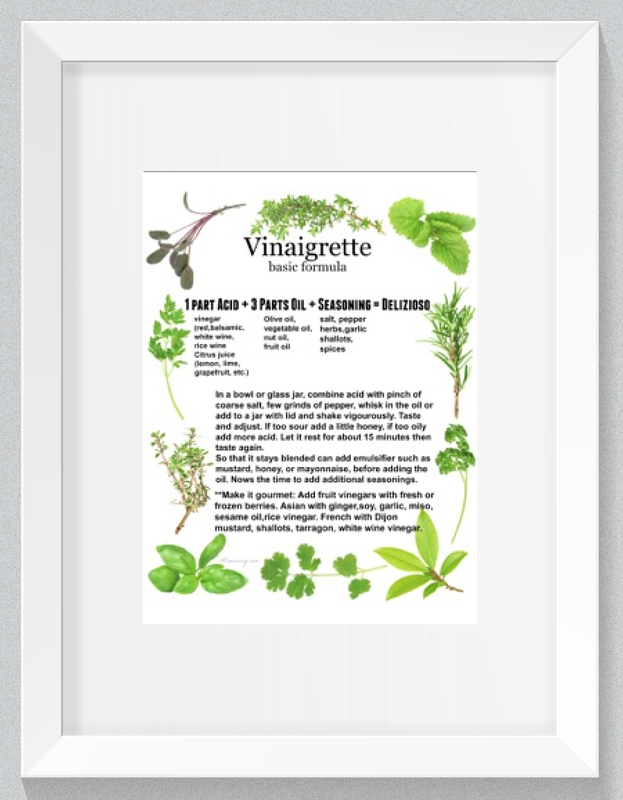 Since I’d never used watercress before, I knew I had to consult my in-house expert — Mr. Google. He never fails me and he usually has plenty to say. I found out more than I needed to know, as usual. I made out my list and headed for Harris Teeter. Unfortunately the watercress they had was very sad looking — wilted and bruised. I asked about a new shipment and found out it would be the next day. I was antsy with anticipation. Finally I got all of my ingredients and gathered them around me on the kitchen counter. I set the water for the orecchiette on the stove to boil. 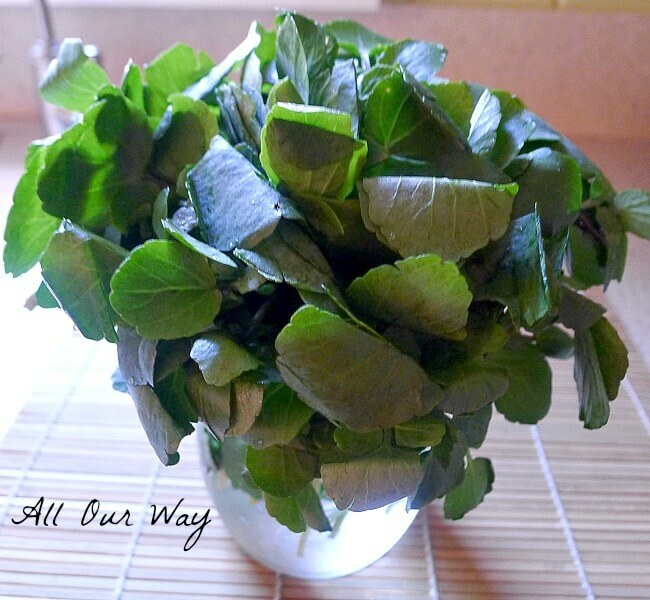 I then prepared the watercress by first rinsing it in cold water and then gently plucking each leaf from its stem. The cress needed TLC. It was going to star in the recipe’s photos. I didn’t want to bruise the tender leaves. Hummm! The clock said I’d been at this preparation for 20 minutes and the recipe said hands-on was 12 minutes.The pasta was done — it was cooling, waiting for the rest of the ingredients. It was a good thing I wasn’t in a rush because it was taking me well over the “12 minutes hands-on” written in the recipe. Finally, all of the ingredients were prepped and I could start assembling. I looked at my end result, then I looked at the picture on the recipe. My dish didn’t quite look like the picture. My ingredients looked green, really green — pea green to be exact. Well, what’s in a color? I was sure it would taste fantastic. I was so sure, I took plenty of photos. I just knew that I’d be posting the recipe and everyone would be pinning it and raving about how wonderful it tasted. I plated our meal and we began to eat. We took a bite . . . chewed . . . waited. . . nothing. Our taste buds weren’t doing a happy dance . . . our taste buds weren’t doing anything . . .they were sound asleep! In fact the bite tasted sort of pasty with a hint of green. After several ingredient adjustments, the pasta dish was eventually consumed — but it wasn’t with gusto! There’s a lesson to be learned here — good ingredients do not necessarily make a good dish. Now we are back to the Grilled Rosemary Chicken with Farro Risotto and I can honestly say that our taste buds did a very happy dance throughout the whole meal. The farro risotto retains a pleasant chewiness as it absorbs the flavorful chicken stock and the kale and Parmesan cheese finish it beautifully. This recipe is definitely a keeper and one we’ll make many times again. Grilled Rosemary Chicken with Farro Risotto is very easy to make. 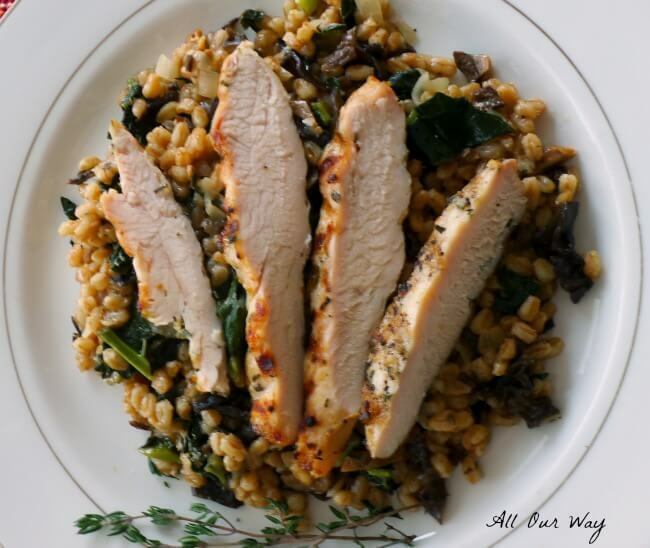 The grilled chicken is first marinated and the creamy farro risotto is combined with kale. Combine 2 tablespoons oil, rosemary, garlic in a bowl. Add chicken; toss to coat. Cover and let stand at least 30 minutes. Combine 1 1/2 cups boiling water and mushrooms in a small bowl; let stand 15 minutes. Strain through a fine mesh sieve over medium saucepan. Chop mushrooms; set aside. Add chicken stock to pan with soaking liquid; bring to a simmer over medium heat and keep hot. Heat a large saucepan over medium-high heat. Add remaining 1 tablespoon oil; swirl to coat. Add onion and thyme; saute 4 minutes or until tender. Add reserved mushrooms and farro to pan; cook 1 minute, stirring to coat. Add wine to pan; cook 1 minute, scraping pan to loosen browned bits. Stir in 1 cup stock mixture and 1/4 teaspoon salt; cook 5 minutes or until liquid is nearly absorbed, stirring constantly. Add remaining stock mixture, 1/2 cup at a time stirring constantly until liquid is absorbed before adding more (about 35 minutes total). Stir in kale; cook 2 minutes. Remove pan from heat. Stir in Parmesan cheese and 1/4 teaspoon pepper. Keep warm. Heat outdoor grill to 400 F. Remove chicken from marinade; discard marinade. Sprinkle chicken with remaining 1/4 teaspoon salt and remaining 1/4 teaspoon pepper. Cook chicken breasts 6 minutes on each side or until juices are translucent when cut.. Place chicken on a cutting board; let stand 5 minutes. Cut into thin slices. Spoon farro mixture onto serving dish and top each serving with chicken breast slices. Sprinkle with parsley. Adapted from "The Grilled Rosemary Chicken with Farro Risotto" recipe in the January/February 2015 Cooking Light Magazine. Note:Recipes and content from All Our way ©2015 is copyright protected. Please do not use content or recipe without prior written permission. If you want to share the information please link to this post. Thank you. This sounds delicious! I love farro risotto! Hi, Sasha! It is really a great dish that’s easy to make and oh, so, good. Farro is a favorite in my house – this looks like a perfect plate of comfort food!! Hello, Ashley! We love farro also! The combination dish is very good. Love, love this recipe! It’s a great make-ahead lunch idea to pack for work! Can’t wait to try it, looks delicious! Hi Neli! It is delicious and I am determined to use more farro in the coming year – I think it is delicious and nutritious. I’ve been meaning to try farro. This looks like a great way to eat it. Hi Christine! Farro is much more forgiving than risotto. You’ll love it! You had me at Rosemary, and risotto is my weakness, I love what is happening here. Will have to make it! Hi Florentina! Risotto is so good!! The farro as a substitute works great! Oh no! Sorry the pesto didn’t work out! I was excited about the potential, especially after seeing the ingredients. The chicken and farro looks delicious though, and I’m happy to hear it was! Well Kathrina, I always did intend to try it again. 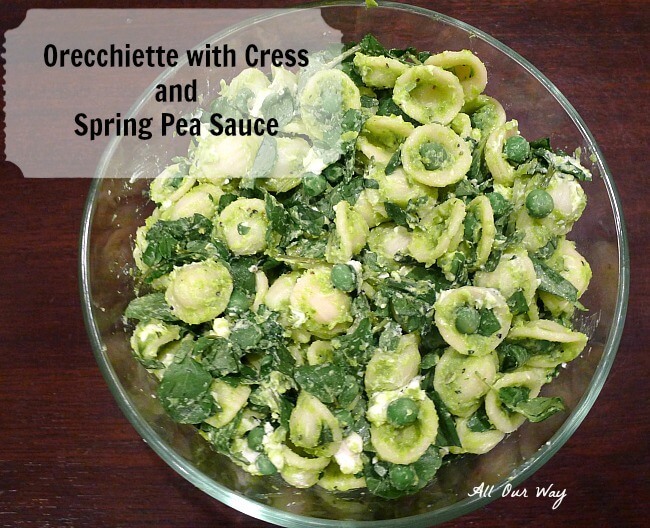 I loved the ingredients too and I worked really hard with the watercress. Hi Anne! Do you think there is special place in heaven for husbands that eat our mistakes???? Hello!! Well, we do like to experiment but the original recipe sounded so wonderful I thought it HAD to be great. I shutter when I think how bland it was. I love the idea of making a risotto out of farro and then adding in the uber-healthy kale!! Pairing that with a rosemary chicken sounds delish and something that we would really enjoy!! Thank you Rebecca! We do love our farro, especially since it is good for us. 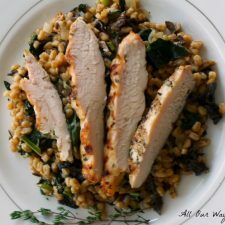 This is such a flavorful and elegantly presented chicken dish; I love the farro-risotto as an addition; beautifully done! Thank you! We enjoyed having a complete meal with the grilled chicken and then the faro risotto. Very Healthy!! I love your story! I can relate to the amazing recipe that wasn’t! I’ve remade several recipes lately going for that taste in my mind that isn’t coming up to scratch in the real deal! This Chicken risotto recipe looks astoundingly delicious! I am thinking this one tastes as super as it looks! Yum! I hope you try it Mahy, it is easy to make and delicious. This dish sounds heavenly! Love the risotto paired with the seasoned chicken, yum! Thank you Jessica. We loved the combination also. Hi Sam! Well it’s “ahead of thyme” for you to make risotto 🙂 Using faro is pretty forgiving and the taste is great. Great looking ingredients for this dish and very appealing photos. Looks good for dinner tonight. Thank you Mark!! Easy to make and delicious too. I’m so sorry the orecchiette recipe didn’t work out. From the sounds of those ingredients, I would have thought it would be fantastic. But you never know until you try it. I’m glad the chicken and farro was everything you hoped it would be. It looks delicious. Hi Marisa, I have never made a Farro Risotto, yours looks amazing so of course it is on my list. As my husband says they all can’t be great, so re-create and make it great. 🙂 Have a wonderful Sunday. Yep!! Hubbies are very helpful with their advice!! This could be my new favorite meal! My mouth is watering just looking at your wonderful pictures. Chicken—Farro–what’s not to love? So simple, yet so tasty. This could be the new Italian comfort food! Keep up the good work, Marisa, Your recipes are always top notch! Thank you for your sweet compliment. I really can’t wait to make this again. 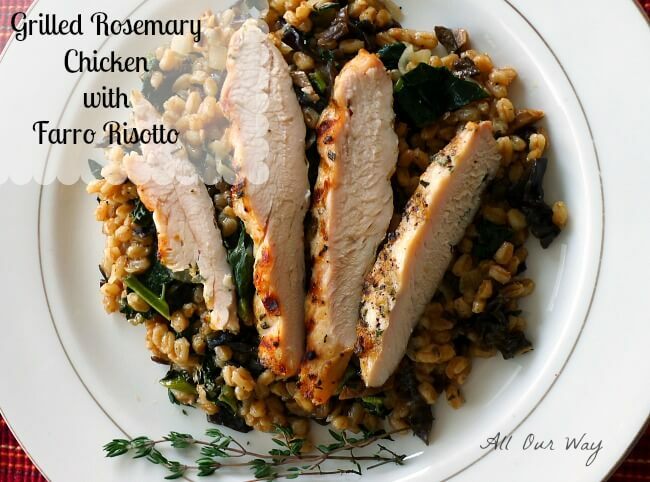 I love making farro risotto and combining it with grilled herb chicken sounds perfect. The dish looks so delicious and the photos are beautiful, Marisa. I bet that was a great dinner. Thank you Jovina, the dinner was very good. It’s like you’ve found something precious and you want to share. I love good recipes.